Autograph Hunters Rejoice; Upper Deck Releases 2011 NCAA Sweet Spot Football Today! New product configuration delivers an autograph card in every pack! Carlsbad, CA (August 2, 2011)– Pigskin fans are rejoicing as we are getting closer to the start of a new season. 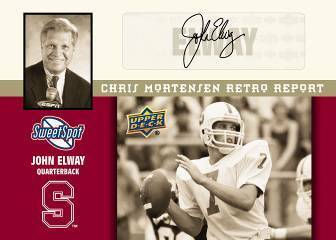 Upper Deck has pulled out all the stops to make sure 2011 NCAA Sweet Spot Football delivers all the hard-hitting rookie cards and autograph inserts these fans cherish. Collectors will feel like they are scoring a touchdown as they open 2011 NCAA Sweet Spot Football because this year every pack has an autograph card inside! The rookie autograph checklist features all the top draft picks like Cam Newton, Mark Ingram, A.J. Green, Julio Jones, Blaine Gabbert, Jake Locker, Colin Kaepernick, Christian Ponder and many more signing in the set. 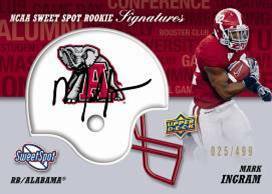 Upper Deck has come up with some new NCAA Sweet Spot Signature helmet logo variations as well to add a heightened level of collectability to autographs of these future stars. 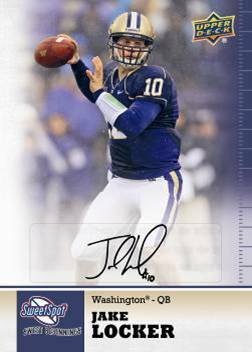 Additionally, the hard-signed “Ultimate Rookie Signatures” set that started in 2011 Upper Deck Football, continues in 2011 NCAA Sweet Spot Football. Beyond the rookies, fans can find autograph cards of gridiron greats like Jerry Rice, Adrian Peterson, Bo Jackson, Barry Sanders, Drew Brees, Dan Marino, Gale Sayers, John Elway, Steve Young, Troy Aikman and others. 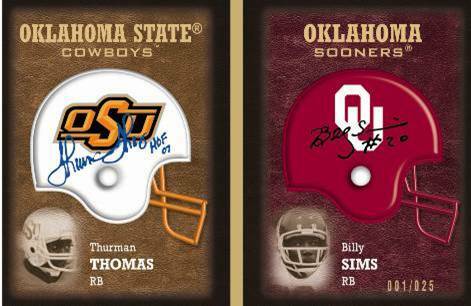 New to the playbook this year are the “Sweet Spot Rivalry Booklet” cards that feature Sweet Spot helmet autographs of two players who squared off on opposite sidelines in some of the most storied rivalries in college football history. These limited cards will fall one per case on average. Additionally, Upper Deck called on football analysts Todd McShay and Chris Mortensen to add their expertise to the mix with “Scouting Report” inserts that give collectors the inside scoop on stars of the 2011 rookie class and a retro look at scouting reports on legends as if they were being drafted again today. Look for rare autograph parallel versions of those cards inserted randomly into packs. Upper Deck’s 2011 NCAA Sweet Spot Football packs contain eight cards with one of those cards being autographed. Each box will contain four packs and football fans can find these boxes in stores today!